Even though the temperature has been below 50 degrees, it’s spring–so I thought that I would make a dessert that was a spring color. These cupcakes in a jar are just as easy as making regular cupcakes, and they make a really cute gift if you attach a spoon with ribbon. Also I made these at home, so the fact that they are portable made it easy for me to bring them up to school for my friends! These are pink vanilla cupcakes filled with almond buttercream frosting. In large bowl, beat sugar and butter until creamed, then add vanilla. In a separate bowl combine flour and baking powder. Slowly add flour mixture to wet ingredients until combined. Add milk and beat on low until batter is smooth. Next, add the pink food coloring and beat until color is distributed. Bake for 20 minutes (watch the cupcakes to make sure they do not start to turn brown!) Cupcakes are done when toothpick comes out clean. On medium/high speed, whip butter for about 8 minutes. Add confectioners sugar, almond extract, and heavy cream. Stir to combine. Once combine, beat for 6 minutes on medium speed. Transfer mixture to piping bag with a 1M tip. Take one cupcake and cut off the top. Place cupcake-bottom into the ball jar. Pipe a swirl of frosting on top of the cupcake-bottom. Take another cupcake, cut off the bottom. Place cupcake-top into the ball jar. Pipe a swirl of frosting on top of the cupcake-top. Sprinkle with pink sprinkles and close the jar! 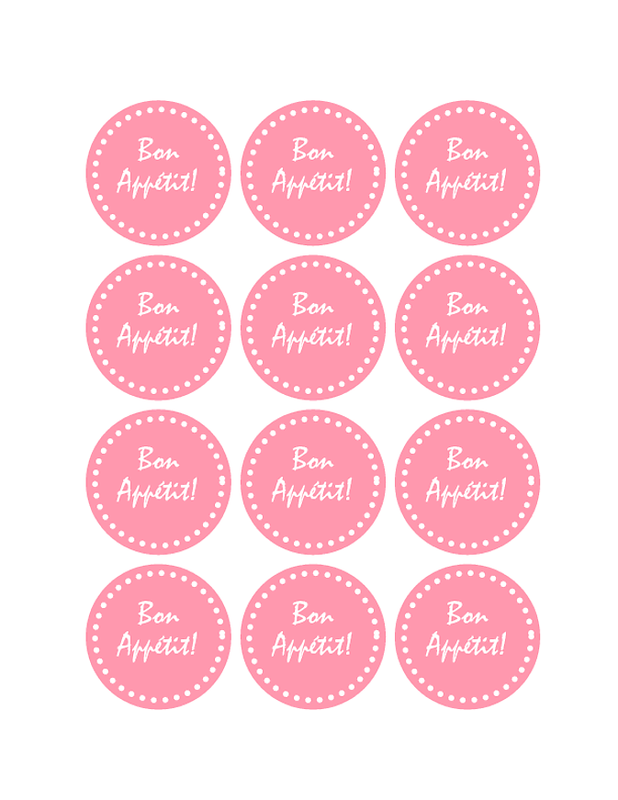 Print 2 inch labels. This is the sheet I used. Cut and apply to the caps of the ball jar with glue stick or double sided tape. Once again, you have out done yourself….very cute! What an excellent idea! It looks beautiful on top of yummy! Love this idea, so cute! It’s already been said but what a cute idea! Wow! These rule! Evidently everything tastes better in a jar. Cake, salad! Love it. So cute! That would be great for a baby shower favor. so cute, this is a great gift ideas! Love this creative and yummy idea! Hi Erinn, I’m putting your link in my Very Inspiring Blogger Award that I’ll publish later. You dont need to do anything, I just want to let you know that I love your blog. This is so cute and different. I just may try this sometime. But did the weight of the top tier of cupcake squish the center frosting? I’m a little worried about that. Thanks for the follow. My goodness I am such an amateur compared tou you and your amazing talent. I love your idea of cupcakes in a jar. In France my daughter had a deconstructed cheescake in a jar at a restaurant which was pretty amazing. Keep on baking, you so have the talent and the passion! what a novel idea !!! love it!!! So glad you found my blog–thanks for the follow! Anything that involves mason jars is a clear winner for me. These cupcakes are (almost…) too pretty to eat! Such a great idea, and so many fun things you can do with this – gifts, baby or wedding showers, etc….love it! The only thing better than one cupcake is two…in a jar…and no mess eating them with a spoon! This is beautiful!!!! Do you have any vegan cupcake/cake/cookie recipes? I’d like to bake something for my sister’s birthday and she refuses to have anything with dairy, honey, and fun. But I suspect you can make anything fun. What a clever way to plate cupcakes! And oh so portable as well! LOOOOOVE!!! I’m kind of obsessed with cupcakes and mason jars so I will definitely need to try these! !